Pro Series Pipe Clothing Racks will add an attractive and unique style to your store. Featuring a matte black finish, Pro Series Pipe Clothing Racks will give your clothing the presentation it deserves. 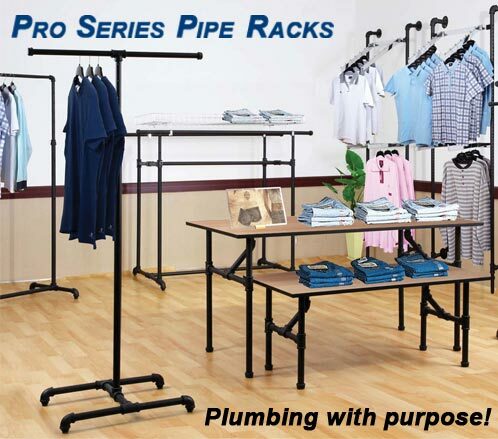 Our line of Pro Series Pipe Clothing Racks includes single rail pipe clothing racks, double rail pipe clothing racks, 2 way pipe racks, 4 way pipe racks, half-round pipe clothing racks, display pipe display tables, pipe outriggers and more. Shop for your Pro Series Pipe Clothing Racks at Palay Display today! Pro Series Round Pipe Clothing Rack - 36"